not long ago here on those pages, i wrote about the enomatic wine dispenser and how i thought it was about to bring a revolution to the wine bars of the world. well my friends, the revolution is fast approaching hong kong! last week, wineroom opened at the sheraton hotel with 3 dispenser machines and in about 2-3 weeks, a new place in central called tastings wine bar will open with 5 of them installed for the convenience of their guests. wine machines? yes. wine machines. 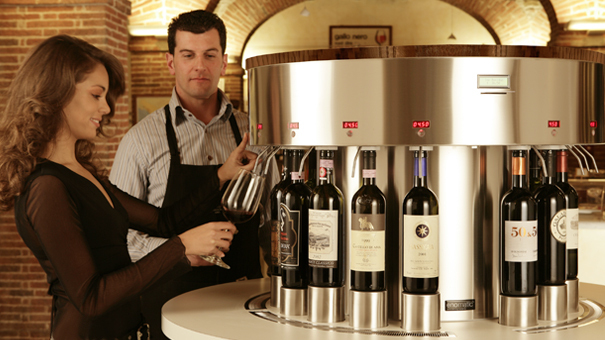 enomatic, an italian company, has perfected this great machine which, with the help of a prepaid card, wine lovers can select a pour size among 3 options: a sip for a taste, 1/2 a glass for a shadow, and 1 full glass on your way to inebriation. the machines installed in wineroom and tastings have the space for 8 different bottles so that we can have plenty to chose from. temperature controlled as well as insulated from oxygen, the machines keep the wines fresh in the bottle for up to 3 months. depending on the creativity of the owners, they can hook up pretty much any kind of wine and rotate them as much as they want so that we can taste a great many wines and, best of all, not worry about service but can help ourselves at the pour. last fall when i visited the wonder bar at selfridges in london, they had a chateau petrus hooked to the enomatic and were selling a sip for 32 pounds. it was well worth it beleive me!